AMS Filling Systems, single head, stainless steel auger filler. Rated from 20 to 120 cycles per minute – depending on materials, application and machine configuration. Equipped with a 22" diameter (16 gallon) agitated product hopper with dust cover, 7" diameter charge port and level detector. Control panel with an AB touch screen display and push button start / stop. 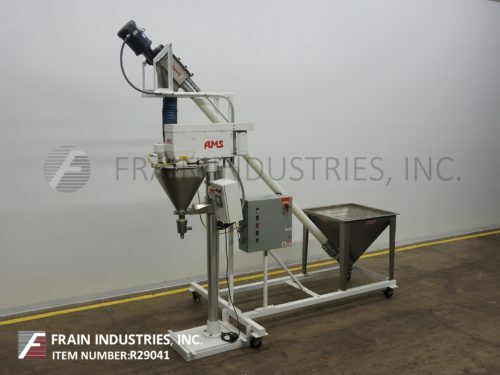 AMS Model A-500 2 Fully Automatic Twin Head Auger Filler with Agitation. Unit is Capable of Filling Powders, Granulates, Liquids, Creams, and Pastes From Milligrams Each Head with a +/- of 1% or Better. Equipped with 8" Pneumatic Stroke and Hydraulic Lift to Raise Containers During Filling & Independent Vibration Controls Per Head, Equipped with a 12 Foot Long Dual Chain Conveyor System with Adjustable Guide Rails and Auto or Manual Pneumatic (Bimba) Indexing. All Stainless Steel Contact Parts, and PLC Control Panel. Hoppers Also Have Level Detectors. Now wired 460V. Semi-automatic, single head, stainless steel, auger filler rated up to 120 cycles @ min, with a fill range of 100mg to 50 lbs and accuracies of +/- 1%, depending on application. All 304 stainless steel contact parts, has a 22" diameter, 16 gallon product hopper, with agitator, dust cover, 7" diameter product port, and level detector. A/B Micrologix 1200 controls, and a A/B 300 swing arm touch screen with panel view, agitator / auger motor drive, electro magnetic clutch / brake, start, reset, E-stop, and is mounted on a painted stand alone base with a foot pedal control. AMS Filling Systems, single head, stainless steel auger filler. Rated from 20 to 120 cycles per minute – depending on materials, application and machine configuration. Equipped with a 22" diameter (16 gallon) agitated product hopper with dust cover, 7" diameter charge port and level detector. Filling head is supplied by a Flexicon, Model 1312, screw elevator. 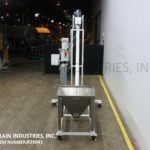 Equipped with a 36" long x 36" wide x 32" deep product hopper with grated cover, 2½" diameter x 120" long stainless steel conveying screw, 4" diameter flexable poly tube and top mounted 3 hp drive. Flexicon Model 1312 is a 3-1/8" diameter x 10′ long screw conveyor capable of transferring 0 to 60 cu ft product per hour – depending materials, application, motor hp, and product density. 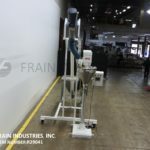 Equipped with (36” L x 36” W x 38” D) product hopper with bolt down cover with 14-1/2" diameter top product port and 1 hp auger drive motor. 3-1/8" diameter x 10′ long stainless steel product conveying screw, with a 4" diameter x 10′ long flexable poly tube. Top 5 Hp motor drive with 5-1/2” inside diameter product discharge port. Quick disconnects designed for ease of cleaning/sanitizing and mounted on a (4) leg common stand.Semi-automatic, single head auger filler. Equipped with 6" diameter top inlet, 18" diameter by 24" deep agitated product hopper and A/B controller. Mounted on a height adjustable frame. All stainless steel contact parts. Speeds dependant on materials, application and machine configuration. Tooling required per application. AMS Model A100 semi-automatic single head auger filler and Flexicon Model 1312 screw conveyor with number of containers per minute – depending on materials, application and operator dexterity. All 304 stainless steel contact parts. Equipped with 22" OD,16 gallon product hopper, with agitator, bolt down dust cover, 7" OD product port, 6" long x 4" wide bolt down acess port and top mounted level detector. Control panel has A/B controller with readout and start, e-stop and run / reset controls. Mounted on painted stand alone base with foot pedal jog control. Accuracies of +/- 0.25%, depending on product and tooling required per application. Flexicon 1312 screw conveyor. Equipped with 36" wide x 36" long x 32" deep stainless steel product hopper with safety grid, 3" OD 120" long stainless steel product conveying screw with 3-1/4" flexable poly tube, top 3 Hp motor drive, with 6" ID product discharge port. Control panel with start, e-stop, reset, forward and reverse controls.